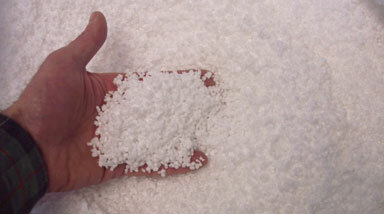 Recycled EPS ground up in the Entyro Foam Ripper is the perfect loose fill insulation. EPS beads can currently be purchased at your larger home improvement stores. The problem is that most stores sell new EPS when a better product can be easily produced through recycling. Shredded EPS is great for blown in insulation, filling cinder block walls, and any where you need to fill an enclosed space with insulating material.